Sweden’s first action water park opened today in Västerås. ÅF has been involved in designing the lighting in the eight-storey palace of pools, Kokpunkten, which offers visitors truly extraordinary experiences. Project manager Jessica Johansson is looking forward to her first dip in the new pools. 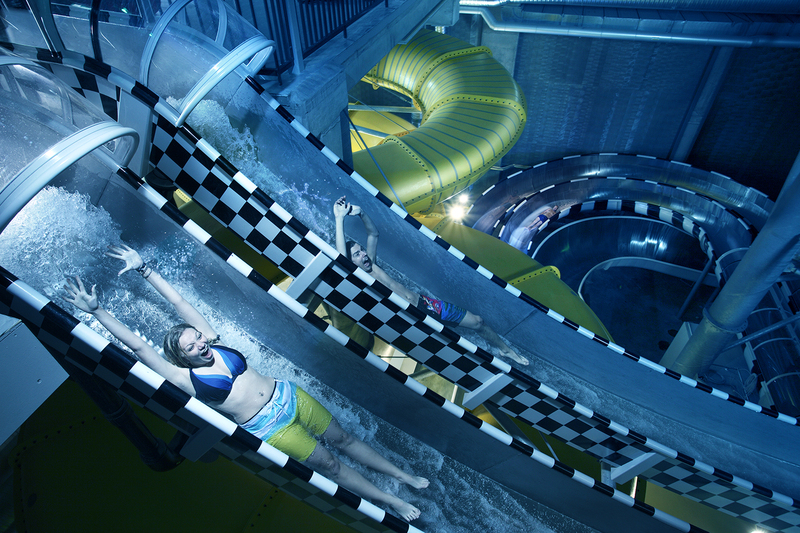 The old steam power station in the heart of Västerås has been transformed into an action water park, brimming with spectacular slides and other attractions. When Kokpunkten opens in August, visitors will also be treated to sound and light shows giving them a sense of being in space or in the middle of a volcanic eruption. ÅF’s project-managing lighting designer Jessica Johansson has been in charge of all permanent lighting installations at Kokpunkten, including the lighting in the pools. What makes Kokpunkten exciting as a project? We’ve had the opportunity to create unique solutions in an extremely cool building. The architects have harnessed the industrial feel of the old steam power station and have utilised the height to create really spectacular slides and other attractions. Lighting has been a key part of the project, and I have worked closely with the project’s concept manager, the architects at Archus in Västerås and event lighting designer Robert Ricciuti. What was the major challenge? Getting all the installations fitted into quite a limited space along with water purification, electricity, ventilation and audio. For me, personally, it has been a challenge to lead a project that involves so many senior members of staff. I have wanted to show that I can deliver even though I’m not as experienced. That’s why I’m particularly pleased to hear how satisfied everyone is with our cooperation. My first dip in the Kokpunkten water park, of course! I haven’t been there since they started to fill the pools in March, but I’m going to take my swimming gear and go for a sneaky premiere swim soon. Kokpunkten is the first major property project that I have been involved in from start to finish, so it will be really amazing to see it become a reality. Read more about our projects within Lighting on afconsult.com.